(This month was crazy cool! Starting with Hail the Sun, I also had a great surprise! 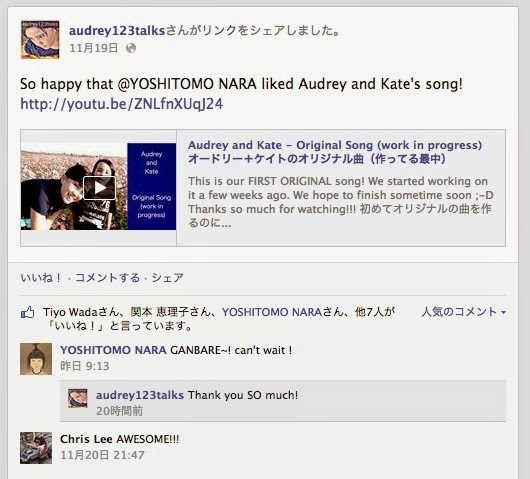 A great artist, Yoshitomo Nara liked and commented on facebook!! I was so happy. Afterwards, I looked at his work on the net. So cool and CUTE! I love his work. It's almost my birthday, so I might get his books!! 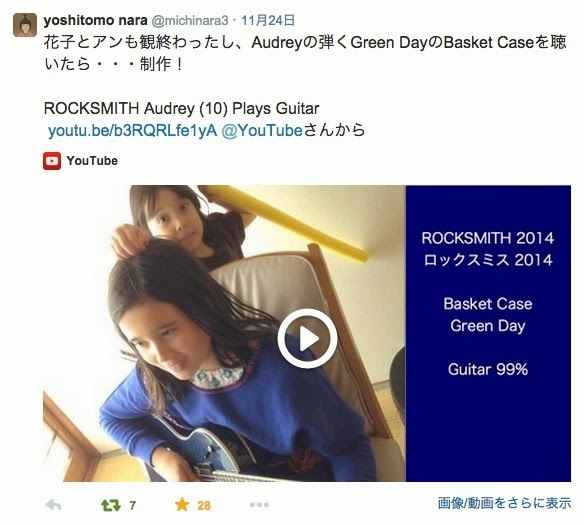 ROCKSMITH Audrey and Kate - Great week for us! Hail The Sun Mentioned us! We are so happy! We got mentioned by Hail The Sun on their official Facebook page! Their song on Rocksmith is very hard for me still but I love playing it on both guitar and bass! I hope I can get better!!! Thanks so much Hail The Sun!! ロックスミスでB'z ギリギリchop 93% ゴールドピック！！ Got a Gold Pick on Giri Giri Chop - B'z on Rocksmith!! I finally got a Gold Pick on Giri Giri Chop B'z!! When I first tried this song, I had no clue to how you can pass the solo section without getting Xs. All I did was to play lots of songs in Rocksmith everyday. And this time, I tried this song and I got a Gold Pick. All I can say is that it is so FUN and I hope to keep playing/learning many many songs!!!! I had the most amazing day. I came home and a HUGE box was waiting for me!! I just couldn't believe my eyes and didn't know what to do with myself. I got a super NICE guitar from Epiphone and so MUCH stuff from Ubisoft SF. Here are the things I got!!!!!!!! 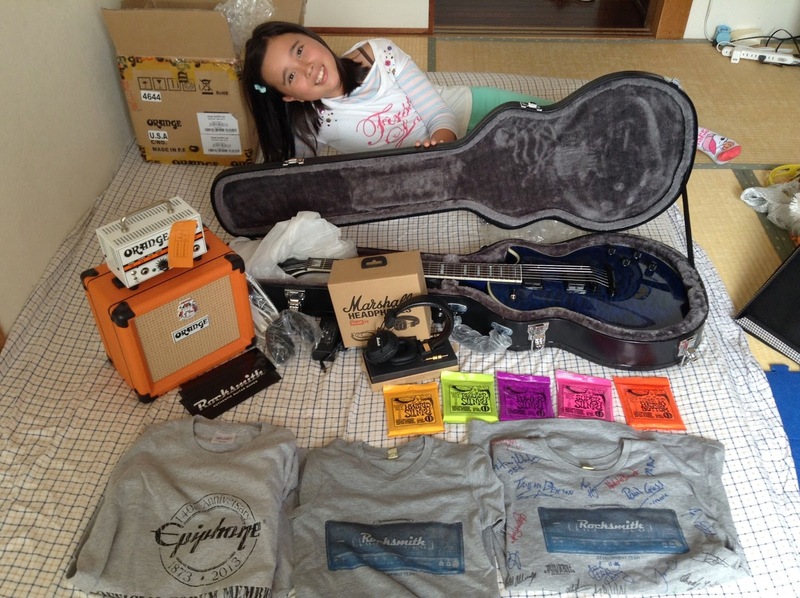 Thank you so much once again, Ubisoft and Epiphone!!!!!!!! 夏休み終わって、新学期！Summer vacation is over! -- BACHSMITH DLC was so FUN!! In August, I played lots of songs but I loved Bachsmith DLC with all the classical music. I first got 100% on Bach- Little Fugue in G Minor in Learn A Song mode. It was my very first try, so it made me really really happy! But there was something even better!!! VS Them vocalist and the person who arranged Rondo Alla Turca, Matt Montgomery wrote a comment on my video! That made me SUPER HAPPY!! I couldn't believe it! I hope to keep playing!!! Hi, it has been a while since my War Ensemble Slayer video went viral. I still can't believe that it has been played over 1.3million times. I received so many comments and I think my video was written in many blogs and articles. I hope to introduce some of them in a video sometime. After my vide went viral, I started recording 3~4 songs everyday. It has been pretty busy but fun! Once school starts, I will have less time but I will play everyday as usual. I can't put all the songs I did so far but here are some that I love! Thanks so much once again for all the support and comments!!! I woke up and my email was filled with youtube notices subscribes, comments, subscribes, comments. It is continuing which I find really surprising!! I am so happy! I had so much fun with Kate in this video!! This week, school ends and it will be SUMMER VACATION!! I hope there won't be too much homework. I've been playing Rocksmith and during vacation, I hope to play even more! I hope that someday I can be number one in bass and guitar weekly challenge. This week, I was first in bass and third in guitar. I really wanted to get over 97% on guitar but failed. I hope to practice and get it someday. I've been playing Rocksmith as usual! It has been really fun but with school and all the stuff going on, it has been a little tough.But not tough enough to stop playing everyday. The other day, I finally reached 365 days of Rocksmith a few days ago. I played every single day for the whole year and it feels really great!!!! We eat and sleep everyday, so why not play everyday???? It was a special day for me. 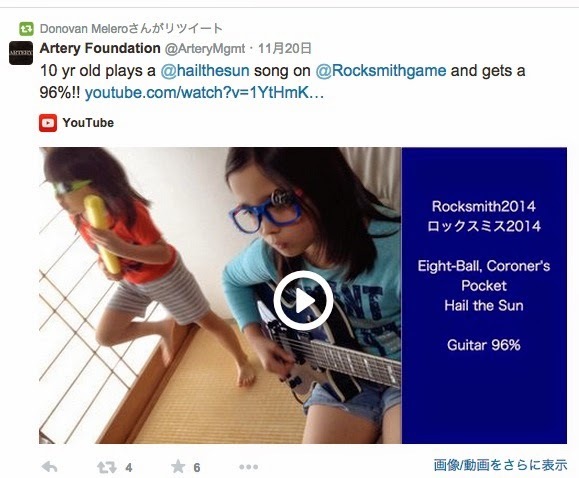 I was chosen as Rocksmith Player Spotlight on Rocksmith official facebook page! Also, on Twitter, Rocksmith sent me some great comments and it made me even happier. I hope to play lots of songs!!!!! It has been a while since last update. School started and I have been a little busy. Anyway, I have been playing Rocksmith everyday!! Next month, I will hit a whole year playing Rocksmith EVERYDAY. I haven't missed a day without Rocksmith, so I am a bit happy! I am still struggling with bends and picking up and down but every week new DLC is comes out and there're so many songs I still want to play well, so Rocksmith has been a super fun hobby for me. I hope to continue playing lots of songs! Last week, I couldn't participate in the weekly challenges. I didn't have the DLC songs. Since I switched to Mac/PC version of Rocksmith, I bought some DLCs but now I am out of funds. It has been a while. I had a nice spring break and school started already. Lately, I finished trying all the Iron Maiden songs from their DLC. It was super fun and challenging. Also, Rocksmith Weekly Challenge has been great too. I got 1st two weeks in a row and 2nd on bass two weeks in a row. I really wanted to get 1st on both, so I was a little sad. Also, I finally got my copy of ROCKSMITH2014 registered to UPLAY. Now, I can see the world ranking on score attack which should be FUN!!! I played lots of song this week. I was so happy to be able to play the newest DLCs right away. I really like Halestorm. I want to get my % up. Also, I was mentioned by La Sera. So, I was really really happy! I didn't do too well in the weekly challenge songs this time. I played other songs too much. Can't wait till spring break! I want to play lots! I've been playing Rocksmith everyday for a while now. It has been fun and rewarding. I didn't just learn to play guitar and bass but also have been competing too. It's been a lot of fun! This week, I got 1st in bass with Iron MaidenのThe Trooper ;-D It was super fun! February was a great month! I got ROCKSMITH 2014 (pc/mac) from UBISOFT SF! It made me so happy. 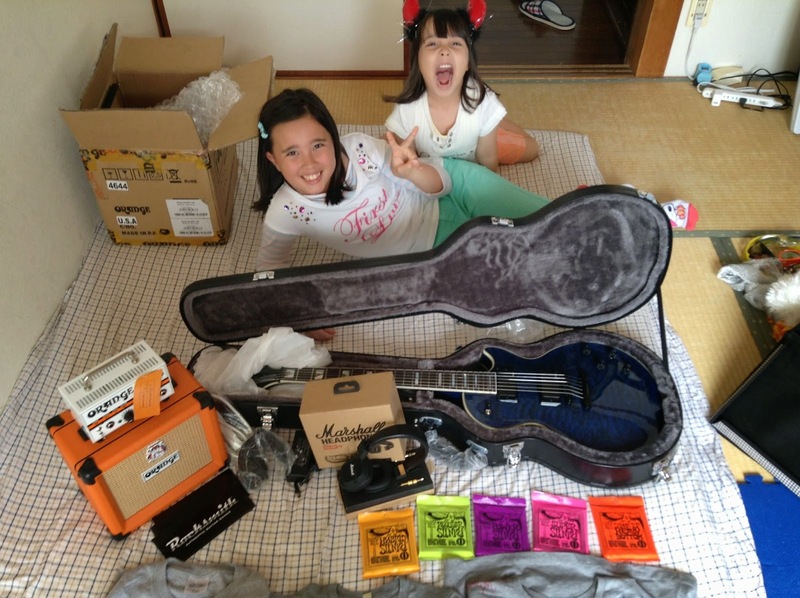 Rocksmith Championship ended. I was able to proceed two steps and ended up 5th. If there is another tournament again, I want to go further. Above all, the highlight was getting FIRST on GUITAR in Division 1 in ROCKSMITH weekly Challenge. It was my first time! I started with Division 3, slowly made it to Divison 1. This time, I had 100% accuracy and the highest score too. It was a happy day!!! I hope to play and learn lots in March too! This week's challenge song was Knights Of Cyndonia by MUSE. The middle part is quite hard but I finally was able to get most of them right. I also used Mac/PC version for the first time to record. It was SUPER FUN!!! For bass, it was Walk This Way by Aerosmith. I played it a while back. I thought I would be able to get 100% but it was too hard for me. I played a lot of songs this week too. 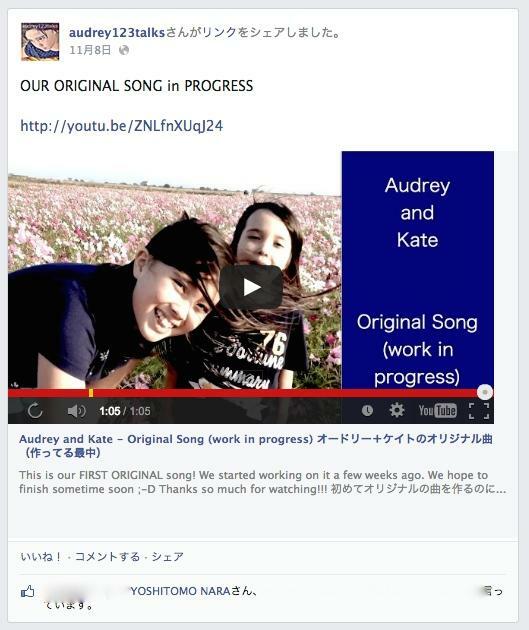 Lately, I have received few song requests as well which makes me really happy. I still have lots to learn but it has been really fun!!! I hope to get better. Thanks!!! ギターチャレンジで一番になれました！ Finally got #1 on Rocksmith Guitar Weekly Challenge!! I finally got NUMBER 1 in ROCKSMITH WEEKLY CHALLENGE with guitar!!! IT was my very first time and I was SUPER happy!! The challenge song was Every Breath You Take by The Police!! I was able to get a 100% on this song after a few tries. I think it wasn't as difficult for me as there weren't so many bends. This time, it was Round and Round by Ratt. I felt really glad because it seemed like I didn't have to do tapping. Anyway, on Wednesday, I felt really sick all of the sudden with a fever and found out that I caught the flu. I couldn't work on the song until Saturday. On Sunday, I tried my best but it wasn't enough... I lost. Oh, well. maybe next time. The second round on Rocksmith Championship was War Ensemble by Slayer. When I first played, I got somewhere around 75%... Felt impossible but I practiced with riff repeater everyday. I ended up with 97%. I had no idea how to do tapping, so I did the Ninja slide and took extra care not to mess up on other parts. I barely passed. I am now in quarter finals, TOP 8! I can't believe it but I am really really happy!!! ROCKSMITH Championship started! I made the qualifier round okay with the song Wires by Red Fang. 1st round was The Trooper by Iron Maiden. It has super hard solos and difficult bends and slides. I couldn't clear score attack for the longest time but I practiced. Finally, I was able to clear and ended up with 97%. Second round is War Ensemble by Slayer. I tried the bass arrangement for fun. Super fast song and hard to keep up. Sounded like there're lots of solo parts so I am a little scared. This week's challenge song was Go Further by Tak Matsumoto. Last week, I got 1st, so I choose this song. I had 97% from a while back and wanted to challenge myself. It was enough for me to get number one again, so I am happy! The guitar challenge was You Really Got Me by The Kinks! I love the song but the barre chords were so difficult for me! I got up to 96.6%. It was quite hard.